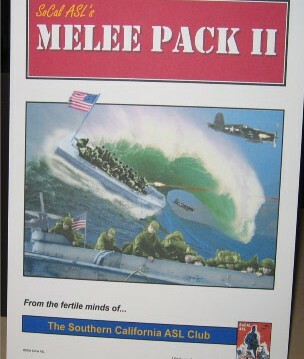 The Southern California ASL Club followed up its Melee Pack I with a sequel the following year. 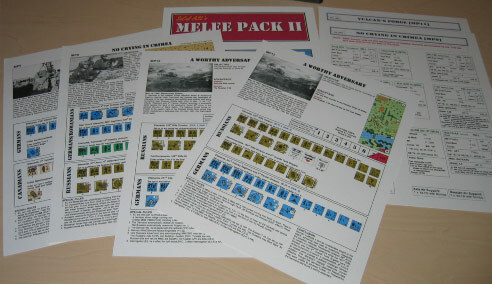 The second Melee Pack had much the same format and content (a small scenario pack with tournament-sized, full color scenarios and “Scenario Cheat Sheets” for most of the scenarios). However, the scenarios were more varied in their subject material than in the first Melee Pack. One scenario features U.S. vs. German combat in the Bulge, another features a British vs. German action in Normandy, three scenarios take place on the East Front, and one travels quite far afield to represent a 1941 border skirmish between Peruvian and Ecuadorian troops! Also, the choosable Orders of Battle from the first Melee Pack didn’t make it to the sequel. The scenarios are printed on cardstock in color, using the VASL graphics of the time, which were fine in 2004 but seem dated in 2014. Of the scenarios, five take place on geomorphic mapboards, while one, MP11 (Vulcan’s Forge), uses the Red Barricades map. The Normandy scenario (MP8, Crater Lake) features AVREs, while MP9 (No Crying in Crimea) uses desert boards to represent Steppe Terrain. MP12 (A Worthy Adversary) features air support for both sides. The Melee Pack II scenarios have not received as much play as their predecessors; the one exception is MP11 (Vulcan’s Forge), which is quite popular, despite the Russians having something of an advantage. 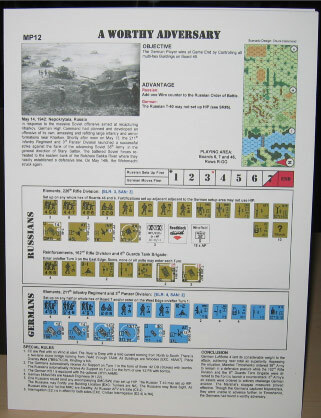 The pack also includes the allegedly “wildly popular” Scenario Cheat Sheets, which are really nothing more than counter and Chapter H information for the various guns and AFVs in the scenarios. Perhaps they are “wildly popular” in southern California, but they seem to be little used elsewhere. It would probably be better if these cheat sheets were made available as downloadable PDF files for those players who like them, without adding to the expense of the scenario pack itself. The scenarios in Melee Pack II, happily, are better balanced than their predecessors, so players are less likely to find themselves in the dogpound. 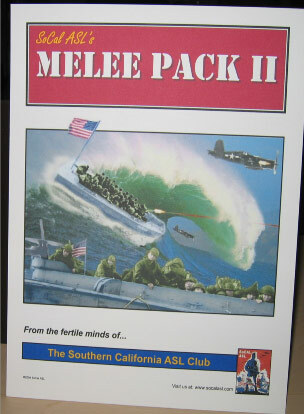 Melee Pack II was a nice scenario pack–small but interesting, with a varied group of scenarios and situations.